The ground floor comprises of one double bedroom with sea view balcony, one twin bedroom and one bathroom. The marble stairs leads you to the upper floor open plan design with ample space to relax, dine and cook. The living area opens onto a generous terrace balcony for alfresco dining. The tiled pool and sun terrace is just a few metres from the apartment. Facilities include full cooker and hob, dishwasher, fridge/freezer, washing machine, large LCD TV and DVD-player. Ample secure parking within the complex. The apartment will be cleaned and have linen/ towels changed once a week. Smoking is permitted on both balconies, from where you can enjoy the direct sea-view. Please notice, there are two properties available for rent in the same block, only furnished in a different way. In both of them you have a direct pool- and sea-view. From the balcony and the terrace, you can enjoy a beautiful sunset! Contact us for availability, and enjoy your holidays on Crete,"Island in the Sun". Hi there. We are Roger & Astrid, a Dutch couple living in Germany. We have six kids together. Roger works as a lock-master on the rivers of Holland and I have a great job as housewife. We'll be happy to welcome you in our beautyfull home on Crete, "Island in the Sun". Bathroom with bath/shower over, washing machine, hairdryer and toilet. Living room with access to sea-view balcony, dining area and large sofa including plasma TV, DVD player, satellite television and I-pod docking station. For the safety of young children, there can be a stair-gate mounted. A golf course within a distance of 5km (Hersonissos). 'The Crete Golf Club'(18 holes). There is also a great water park in the neighbourhood. Apartment was very comfortable and spacious for 3 people. The best equipped kitchen we have seen and loads of wardrobe space and hangers!! We overlooked the lovely pool that we virtually had to ourselves for the 2 weeks we were there - the odd other family used it at different times - great for inflatables. Could see the sea from the balcony which had plenty of room to eat and didn't get direct sun so good at lunchtime too. Owners and in village manager were all very helpful with pre holiday questions and queries whilst on holiday. Apartment is well placed to visit areas in Eastern Crete with a hire car or to take the ferry from Heraklion to Santorini for a couple of days. 20 min transfer from the airport - Euros 30 each way. Some lovely restaurants in the village and the locals made us feel very welcome. Thank you for staying at our property during your holidays and for your review. We will be more than happy to welcome you again on Crete. Our family (2 adults, 12 Y.O. and 3 Y.O daughters) stayed at Analipsi Residence Maisonette in Aug 2018 for an 8 day vacation in Crete. 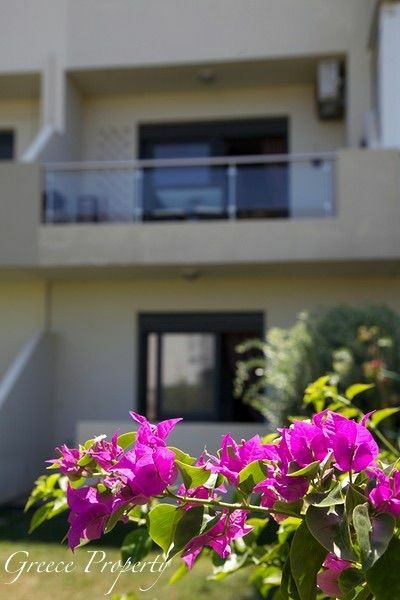 The maisonette is a good size with all the facilities we needed for our stay in Crete. The property is clean, tidy and well decorated making it feel like a home from home. It has a great range of equipment for self catering, and the kids loved the collections of books, toys and pens. We also found the parking space useful for the hire car. The kids loved the pool and it was a great addition to the little complex this accommodation is based in. Although it is a shared pool we only saw 2 other families using it in the time we were there and most of the time we had it to ourselves. The local beach is only a 5 min walk through the village. The village has an incredible number of restaurants, all those we used were very high quality and great value. The village of Analipsi is ideal location for family holiday on north coast of Crete, 20mins drive from Heraklion airport. Communication from the owners Roger and Astrid (and their local property manager Adriana) has been fantastic and made us feel relaxed and very welcome. Would highly recommend this lovely little property for couples or families looking to holiday in Crete. Thank you for staying with us and for your great review. We’ll be more than happy to welcome you again in Analipsi. We loved this property, clean , tidy very comfortable,the air con worked effortless when needed. Everything we needed plus more. A fabulous private pool ,again well maintained and obviously looked after. We were meet by Adriana who was very welcoming and made sure we had everything we needed. This is by far the best private rental I personally have stayed at to date . The owners Roger and Astrid can be very proud in the fact that their holiday rental is high end and compliments your holiday surroundings perfectly. This property made our holiday complete. Thank you guys - We will be coming back . Thank you for making our visit to the island a fabulous one . I would recommend to anyone thinking of booking this property to do so with full confidence that you will enjoy your stay very much indeed. It feels good to hear that enjoyed your stay in our property. We’ll be more than happy to welcome you again in Analipsi. Thank you! our stay with great diligence keeping in touch all the way to ease us into our stay. Thank you so much for your Nice comments. The property is clean and modern and in a quiet neighbourhood. Nice and secure with bedrooms downstairs and living room and kitchen upstairs. Very homely and the air conditioning is very efficient. The pool is hardly used by residents of the other apartments. The village of Analipsi is only 20 mins from Heraklion airport and has a good selection of bars and restaurants although i feel that their trade has been ruined by the increase of all-inclusive resorts in the area. We only had good food from the local eateries and they were all very inexpensive. This holiday was more relaxed, luxurious and cheaper than anything that an all-inclusive resort could provide us. The local beaches are ok, but you do not have to travel far to reach some amazing beaches. If you want more excitement then Hersonissos is only 5 minutes away by car, with nightclubs etc. If you do want to cater for yourself then this apartment has the best kitchen of any that we have stayed in. A full sized, modern, oven. A dishwasher. And a full sized fridge freezer. And with Lidl on a 3 minute drive away and 3 well stocked local supermarkets within walking distance it is perfectly feasible to prepare all you own meals for the duration of your stay. Our stay was my wife and I and our 2 teenage sons. We had an enjoyable and memorable stay. Thank you for your nice comments. We as owners and our property manager always try to do our best to make the stay of our guests pleasant. You are always welcom to vist us again on "The Island in the Sun". In August we (2 adults) stayed in the appartement for 2 weeks. We had a great stay. In the appartement you'll find everything you need and even more. Its suiteable for familys with young or older kids as for adults. It's in a quiet surrounding with view on the swimmingpool and the sea. To the sea its a short walk. The appartement is just as good as you see on the photos. A big plus is that after midday the sun doesn't shine on the balcony but if you want you can enjoy the sun at the lovely pool. Analipsi is a small but cosy town at the sea and nearby Chersonissos. Thank you so much for your nice comments. We always do the best we can to ensure a wonderful stay of our guests. The golden sandy beach with clear blue sea is just a few 100 meters away, making this an ideal resort for families and sun seekers. Heraklion airport is 18 km from the property, it is about a 15 minute taxi ride. If you want, we can arrange a taxi driver awaiting you with a nameplate at the arrivals. Costs for this service plus the ride to the apartment is approx. €35,--. All car hire can be arranged from the airport, or at the apartment. Analipsi is a cobbled street village with all the facilities to make your stay memorable. Restaurants, shops, mini-markets, bars, bakeries and lots more just a short walk way. The golden sandy beach with clear blue sea is just a few 100 meters away, making this an ideal resort for families and sun seekers. The nearby town of Hersonnisos offers great shopping, bars, restaurants, nightclubs and large supermarkets. The main airport of Crete, Heraklion, is only a 15 minutes drive away. The old Venetian Port and Castle "Koules". Shopping, entertainment, and sightseeing could be perfectly combined in Heraklion and just 23 km from the anciënt Palace of Knossos.